Have you always imagined having your wedding in a tropical paradise? There’s a reason the Caribbean Islands rank in the top three locations for a destination wedding, with Jamaica as the leading country. The weather is consistently warm and sunny, the perfect ceremony backdrop comes free of charge, and potential issues like language barriers aren’t a problem. The island’s mix of white beaches, tall mountains and exotic plants and animals create a perfect place to celebrate the union of two people in love. Planning a destination wedding can be overwhelming, but at Tensing Pen, we try to make the planning process as simple as possible. Here are some tips for planning your wedding at Tensing Pen. Tensing Pen Resort is one of the most gorgeous and unique resorts on the island. The atmosphere of the resort is relaxed and welcoming – perfect for an overwhelmed bride. The most popular time to visit Jamaica is typically December through March, with most couples planning their events in March, April, and October. During this time, expect to see sunny skies and temperatures ranging from 75 to 85 degrees with a consistent ocean breeze to cool you down. Whether you want a traditional or themed wedding, we work closely with you to ensure every detail of your wedding is met. In addition to the natural esthetics of the Tensing Pen grounds, we can enhance and set the scene to take on any atmosphere you desire. We can infuse elements from the island to create themes. We’ve created beach themes, arches made from local palms, and used Negril’s magnificent sunset as a backdrop. 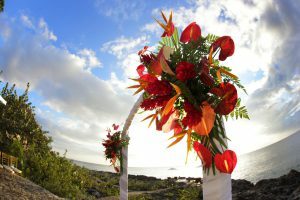 Embrace the island culture by including reggae music at your reception or use bright, tropical flowers in your bouquets. Tensing Pen’s wedding coordinator can provide couples with photos and videos from previous weddings to give them a better idea of the type of decorations we have available. Couples typically book weddings 12 – 13 months prior to the event. If you are interested in booking a wedding in November or December, keep in mind that those months are popular for holiday travel and you’ll want to reserve the resort well in advance. Some wedding parties choose to book the entire resort. Consisting of 25 unique cut-stone, local wood cottages overlooking the Caribbean Sea, the 25 rooms can accommodate 54 guests. The Lodge and Poolside area can hold up to 100 people, and the SeaSong Hut can hold up to 60 seated guests, with an additional 20 on its stone deck. Should your number of guests exceed our limit, Tensing Pen maintains a great relationship with nearby walking distance hotels, where we offer you the option of accommodating your additional guests. Secure your wedding date with a 50% deposit on each room. Once guests start booking their rooms, we can refund each deposit or use it towards wedding expenses. To contact Tensing Pen’s wedding coordinator, send an email to weddings@tensingpen.com or call 1-800-957-0387. Tensing Pen is very flexible when it comes to forming the perfect menu for your big day. Our chefs use local and organic ingredients to create a variety of dishes. They will craft meals to accommodate all guests with dietary restrictions. 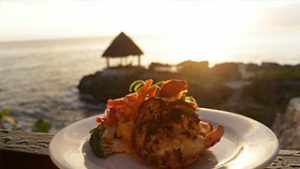 Whether you choose to put freshly caught fish, fresh lobster (seasonal) or traditional jerk chicken on the menu, our culinary team will tantalize you and your guests with their creations. Food is an important aspect to any celebration, and Tensing Pen only offers the best. After the wedding celebrations, you and your guests can enjoy all the activities that Negril has to offer. The island is known for its sandy white beaches, limestone cliffs and turquoise waters. Tensing Pen holds a prominent place among the cliff hotels, a short walk from various locations and attractions. 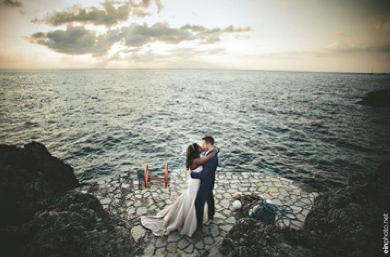 Celebrate your union by leaping from the cliffs into the Caribbean Sea, snorkeling with colorful marine life in the reefs, or taking a rum tour to get a real taste of old Jamaica. Explore the island, and we’ll be here to pamper and take care of you when you return from your adventures. Interested in Planning a Tensing Pen Wedding? Contact the resort wedding coordinator at weddings@tensingpen.com or call 1-800-957-0387. You can also check out our Pinterest Board, @tensingpen/Wedding. We hope to hear from you soon. Checkey Beckford and Jimmy Atkinson met for a quick coffee date in March 2014. But what was slated to be a quick 30 minutes turned into nearly four hours of talking in the coffeehouse and strolling through Union Square Park. Although it was wintertime in New York City, the pair had found paradise in each other. Nine months later, they were engaged, dreaming of an unforgettable wedding experience rather than a single day of festivities. The island of Jamaica became their destination of choice. With Checkey originally from Trelawny Parish, hosting a destination wedding made it possible for her family still living in Jamaica to attend. It also gave Jimmy’s family a taste of where she grew up. After looking at a few other resorts, the couple was wooed by the romantic cliff views of turquoise Caribbean water and intimate atmosphere at Tensing Pen. “I just couldn’t imagine my wedding pictures without one of us standing on that footbridge,” Checkey said. Once again, the pair had found their paradise. The couple planned a dinner the first night to welcome everyone to the island and decidedly kept the rest of the schedule flexible so visitors could be as leisurely as they pleased. Most guests made a long weekend out of the occasion and enjoyed relaxing on the seven-mile beach, leaping (or watching others leap) off the cliffs at Rick’s Café and exploring Negril. While planning the wedding experience was stressful, Checkey’s calm partner balanced out her impulse to worry about every little detail down to the votive holders and flower petals, reminding the couple why they work so well as a team. Checkey’s firebrand personality complements Jimmy’s laid-back approach to life. Together, they are able to stay grounded. The expertise of Tensing Pen’s wedding coordinator, Shanique, also simplified the planning process. “Shanique was very helpful. She kept me on track when I could have gotten lost in the sea of details,” said Checkey. And once the pair arrived in Jamaica, the native “no problem” mindset triumphed over all the nerves and anxiety involved with the build-up to their wedding. Checkey and Jimmy were married on April 2, 2016. Although the couple has since returned to their New York life, where Checkey is a news reporter and Jimmy works in finance, memories of paradise keep them warm. “Our friends and family still talk about it as the best wedding they’ve ever been to,” Checkey said. 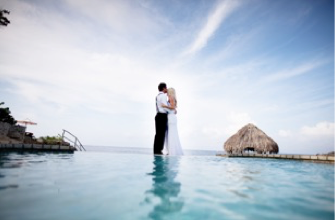 Interested in a Paradise Wedding Experience like Checkey & Jimmy’s? Contact the resort wedding coordinator at weddings@tensingpen.com or call 1-800-957-0387. You can also check out our Pinterest Board, @tensingpen/Wedding. The selections are endless when it comes to choosing where to get married, but Jamaica has certain qualities that makes it stand out from the rest. 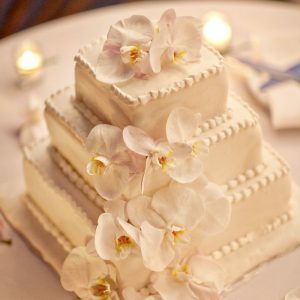 Here are a few reasons why you and your fiancé should say your vows in this tropical wonderland. Tourists typically travel to Jamaica to dive into the crystal-clear water, swim with marine life in the reefs, and marvel at the vast sea from the limestone cliffs. However, the Caribbean Sea isn’t the only natural wonder to see, the island is home to many mountain peaks tall enough to see both coasts of the island from. The beautiful scenery will create a stunning natural backdrop for your Big Day. Jamaica is known to only have one season: summer. Because it’s located in the tropics, Jamaicanever sees a real autumn or winter. Though it is a popular destination year-round, the best time to visit is typically January through March. During this time, expect to see sunny skies and temperatures ranging from 75°F to 85°F with a consistent ocean breeze to cool you down. Flying to Jamaica from Florida takes just an hour and a half. If your guests are coming from the Northwest, they’ll have a little lengthier flight of about 7 hours. 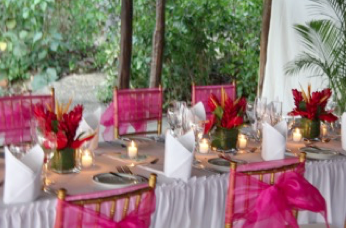 Compared to other destination wedding sites, Jamaica is very accessible. Guests will fly into Montego Bay and take a taxi ride or resort-arranged car to Negril to get to Tensing Pen Resort. On an island that is known for Bob Marley and his calming reggae music, brides shouldn’t have to worry about a thing. Because every little thing is going to be alright. Whether you want a traditional or relaxed wedding, Tensing Pen will work closely with you to make sure every detail is met. 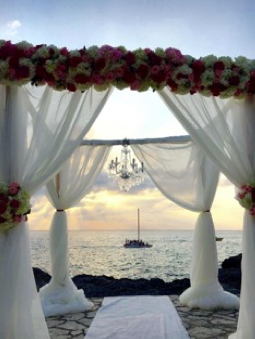 Walk down the aisle barefoot and get married with the tropical ocean breeze flowing through your hair. To get married in Jamaica, you’ll need to fill out an application and provide documents such as proof of citizenship, proof of divorce if applicable and a certified copy of the death certificate for widow or widower. Though couples do not need to be residents of Jamaica, they must wait 24 hours to be married after arriving on the island. If you are getting married at Tensing Pen, your minister fees and official paperwork are taken care of by the resort’s wedding coordinator. The costs are wrapped up in your wedding package. All you need to do is show up in your wedding dress. This tropical paradise is rich with activities, amusement and adventure. Things to do on the island include dolphin lookouts, humming bird watching, dives from the popular timber cove bridge, viewing spectacular sunsets, romantic strolls along the rocky shoreline, swimming and snorkeling. Tensing Pen holds a prominent place among the cliff hotels, a short walk from various locations and attractions. Ensuring that your guests are eating well is important and Jamaica has some of the most fantastic flavors to try. Tantalize your taste buds with freshly caught fish, traditional jerk chicken or curry goat. Spice up your Big Day with a little spice in your meals. Tensing Pen is very flexible when it comes to forming the perfect menu for your big day. The chefs use local and organic ingredients to create a variety of dishes and craft meals to accommodate all guests with dietary restrictions. There are many different types of resorts on the island: chain resorts, all-inclusive resorts and boutique resorts. Jamaica has any kind of experience you are looking for. If you are looking for a unique Jamaica experience, Tensing Pen is as close as you can get. With its variety of cottages, you can spend your stay looking out at the Sea or nestled in tropical foliage. The official language of Jamaica is English, so no need to worry about language barriers. You’ll notice locals will talk to each other in Patois or Creole, however, they will default to English when communicating with travelers. You won’t run into any obstacles while planning with wedding vendors. If you’re looking to get married in Jamaica, look no further that Tensing Pen. Our wedding coordinator is here to ensure that your wedding dreams become a reality. She can help you choose wedding décor, make reservations and decide on food and drink options. 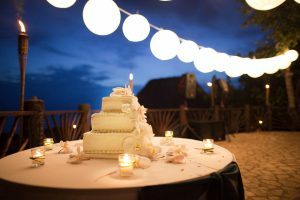 The resort will decorate the venue for you and tear it down when the celebration winds down. At Tensing Pen, destination weddings are simple. Contact the resort wedding coordinator at weddings@tensingpen.com or call 1-800-957-0387.You can also check out our Pinterest Board, @tensingpen/Wedding. It was love at first sight. Sam Petros first discovered Tensing Pen on a trip to Negril, Jamaica in 1989. He was walking on the west end road of the resort town, when he stumbled across Tensing Pen. That first night, he stayed in a treehouse room, called the Pillar, overlooking the cove and the Caribbean Sea. This was his first of many stays at the resort. After patronizing Tensing Pen for three years, he bought the resort in 1992 together with two partners. This year, he decided to take over the full ownership of the destination resort. Sam has plans to upgrade, build and add on to sections of the resort, all while maintaining the natural beauty, architecture and mystique that makes Tensing Pen unique. This includes maintaining the lush tropical foliage that gives the resort its sense of secluded privacy and intimacy. Immediate plans are to upgrade and enlarge the bar and dining areas, as well as add sun decks along the Caribbean seafront. The second phase will be to upgrade the massage hut and build four more cottages to allow more visitors to share in the Tensing Pen experience. Throughout the upgrades, Sam intends to continue using local resources to support the Negril community. The entire resort is built from artisan materials such as local wood, hand-cut stone and thatch, all handcrafted by local tradesmen. To make a reservation at Tensing Pen Destination Resort, book online, email or call at 1-800-957-0387, or from abroad +1-876-957-0387. Nestled in a private cove, Tensing Pen is the ideal destination for discerning travelers looking to escape and unwind off the beaten path. Whether you’re jumping from the resort’s iconic bridge into the Caribbean Sea, or relaxing in our open-air massage hut, Tensing Pen offers a perfect mix of leisure, luxury and adventure. Here is our list of the top ten things to do at Tensing Pen Resort. Leap from the iconic bridge and plunge into the Caribbean Sea below. The 18′ high bridge links both sides of the resort property. Need more adrenaline? The nearby deck is 21′ high. Intimidated? Gain some confidence by jumping from limestone cliffs closer to the water. Guests can also take a dip by stepping down the handful of ladders that have been built into the cliffs. There are several routes that lead you to the sea, but the general consensus at the resort is before you leave, you won’t be able to resist the temptation of jumping from the bridge. Discover a variety of colorful fish and wildlife that live under the surface of the crystal clear water of the Caribbean Sea. The waters that surround the island are bursting with vibrant sea life and all you need to see them is a snorkel. Snorkel equipment can be rented from the gift shop. Depending on the location and time of year, you may see starfish, puffer fish, angelfish, sea cucumber, turtles, stingrays and rock lobsters while diving beneath the depths of the water line. A few hundred feet out, dolphins can be often spotted early morning and at sunset. Ridgebacks At Tensing Pen, dogs come with the territory. Offer some treats and they will happily be your faithful companions for your entire vacation. Dogs have roamed the resort since it opened in the 70’s. The original dog, Tensing, was a Tibetan Lhasa Apso and resort was his home and his pen. Tensing was named after Tenzing Norgay, the Himalayan Sherpa who accompanied Sir Edmund Hillary to the Everest summit; the first climbers to ever reach the peak. Read a book, take a nap or just put your feet up and enjoy the view from the hammock hut, overlooking the Caribbean Sea. The hammock hut sits away from the cottages and restaurant on the cliffs of the sea. Other hammocks are hung throughout the property, offering secluded relaxation. It’s a peaceful and private space to close your eyes, feel the breeze from the ocean and truly relax at Tensing Pen – where life is simple. Drop everything and watch the orange sun sink into the horizon of the Caribbean Sea. Sunsets aren’t visible to everyone on the island of Jamaica, and no sunset in the world compares to a Negril sunset. Sunsets in Negril are known for their therapeutic properties in calming and relaxing your mind body and soul, a state of mind everyone plans to accomplish in Jamaica. From breakfast smoothies, to midafternoon island daiquiris, the resort bar is the perfect location to get together with friends and family and watch the sunset. Ask Razer, the bartender, for a lesson in how to mix a “Dark and Stormy” his way. Saddle up to the bar, located inside the Lodge, and cheers to your vacation with cups full of island specials, premium liquors and wine. Continental breakfast with local fruits is complimentary, additional items can be ordered à la carte. Jamaican-style feasts are offered for lunch and dinner. Because the chef uses the finest ingredients and organic vegetables fresh from local farmers, the menu changes with the seasons. Tables, chairs and couches fill the open-air main dining house overlooking the Caribbean Sea. All meals are cooked to order, so reservations are advised for dinner. Enjoy the local grilled lobster, fresh caught fish and jerked chicken. From sculpture to pottery and painting, Jamaica is known to have some of the most talented and unique artists in the world. Visit the resort gift shop find the perfect handmade souvenirs to take back to your friends and family. Buy a gift for yourself, so you can remember the sun on your face, breeze of the ocean, and feeling of serenity you had at Tensing Pen Resort. To make a reservation at Tensing Pen Destination Resort, book online, email or call at 1-800-957-0387 from the U.S., or from abroad +1-876-957-0387. Negril is a small beach resort town located on the western tip of Jamaica, about 50 miles from Montego Bay. Negril is known for its sandy beaches, limestone cliffs and turquoise waters. The West End of Negril is also referred to as “the Cliffs” because of the area’s limestone outcroppings. Tensing Pen Resort holds a place of prominence among the cliff hotels, a short walk from various scenic locations and attractions. Here is a list of 10 things to do in Negril near Tensing Pen. One of Jamaica’s famous hot spots is just a short walk from Tensing Pen Resort. Rick’s Cafe sits on top of a 35-foot high cliff and boasts it has an unrivaled view of the sunset. Watch some brave souls take a leap of faith from the cliffs, while professional divers jump in the Sea above the trees at 60-85 feet. Rick’s Café serves lunch, dinner and happy hour with a menu featuring Caribbean and international cuisine. A glass-bottom boat snorkel trip is a classic Negril experience. The boat will take you around the reefs where you can peer down at marine life 20-feet below through the glass. Get wet and go snorkeling off the boat. Snorkeling around the cliffsides, you’ll find stunning rock formations and underwater caves, while the reefs inhabit marine life such as starfish, stingrays and colorful fish. One of the most popular boat tours in Negril is Famous Vincent Glass Bottom Boats. Snorkeling guides like Vincent are always floating around the shoreline. Find one you’re interested in and go on an ocean adventure. Admire Jamaica’s beautiful landscapes and shore by horseback. Horseback riding tours will take you through white sandy beaches and lush trails where you can watch parrots in the trees. Ride through the ocean on a majestic horse and feel the water splash onto your feet. Many tours offer swimming on private beaches during the ride. Clip in and glide through Negril’s lush foliage high up on a zipline. Once you’ve geared up in your helmet and harness, you can zip through the jungle hundreds of feet high above sea level. Land on various platforms with amazing views of the island before zipping down to the ground. Adults and children of all ages can enjoy sailing through the rainforest. Find interesting arts, crafts and trinkets at the local shops. The Time Square Mall offers Negril’s best selection of watches, jewelry and accessories. Find perfumes, books, cigars, coffee and clothes to bring home as the perfect gift. The Negril Crafts Market is a collection of shops selling crafts such as wood carvings, beds and jewelry. Expect to haggle with sellers and offer half the price you are quoted. Rum tours like the Appleton Estate Rum Factory Tour give you a real taste of old Jamaica. Tour the distillery and learn how sugarcane, molasses and sugar mix to create great wine and rum. You’ll not only learn how rum is made, but also taste the variety of blends ranging in taste and strength. After the tour at Appleton, you have the option to enjoy Jamaican lunch before returning to Tensing Pen with your bottle of fine rum. Jump into a tube and float down Jamaica’s Great River. Relax and lounge in the sun while you learn about Negril’s flora and fauna, and look for wildlife along the banks of the river. Lazily float through Negril’s jungle, then shoot through some quick rapids. Enjoy the bright sunshine as the river propels you downstream. Looking to catch a fish to write home to about? Try your hand at deep-sea fishing. Tours like Stanley’s Deep-Sea Fishing will take you eight miles out into the Caribbean Sea. Try your luck at catching blue marlin, mahi mahi and tuna! Watch for whales and dolphins while you’re casting your line. Trips include all the fishing equipment and drinks on the boat. Peak seasons are the fall and winter months. After a hot day on the beach, it’s great to tour the local watering holes. Take your pick of beach bars, sports cars, nightclubs, lounges and dive bars. Listen for nightlife venues blacking reggae music on Normal Manley Boulevard, the only major road in Negril. Drink some rum or Red Stripe on the beach at Bourbon Beach, or head to The Jungle, the most crowded and famous dance club in Negril. Whatever your preferences are, there is a nightlife option for you. To make a reservation at Tensing Pen Destination Resort, book online, email or call at 1-800-957-0387 from the U.S., or from abroad +1-876-957-0387. We hope to hear from you soon.